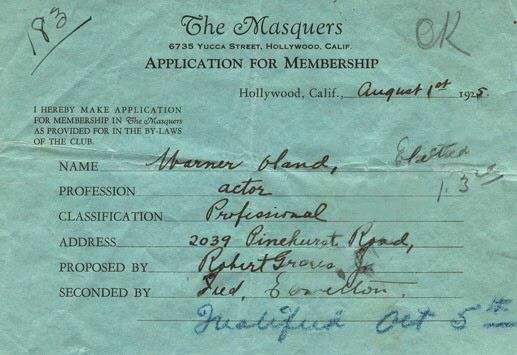 The Masquers, "Hollywood's oldest social and fraternal club," was founded in June of 1925. Over the decades, many of Hollywood's elite have belonged to this organization. Five months after its founding, Warner Oland applied for membership and, as can be noted, written in blue pencil on the applicacation, he "Qualified Oct. 5th." On his application, Warner Oland noted his address as 2039 Pinehurst Road. Today, all that remains of the home at that Warner Oland shared with his wife Edith is the address, corresponding to no existing dwelling, which remains on a stone wall next to a long set of steps that may have been used by the Olands to reach their house. Judging from the older homes that still grace the the slopes of the quaint road that climbs gently upward for a short distance to the base of the Hollywood Hills, Warner Oland's home was probably of modest size. 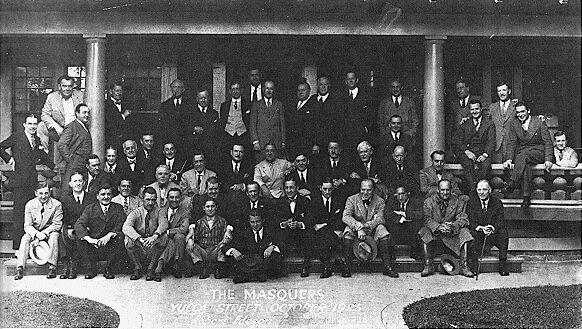 In October 1925, the Masquers posed in front of their club which was located at 6735 Yucca Street in Hollywood, a mere five minute stroll from Warner Oland's home on Pinehurst Road.